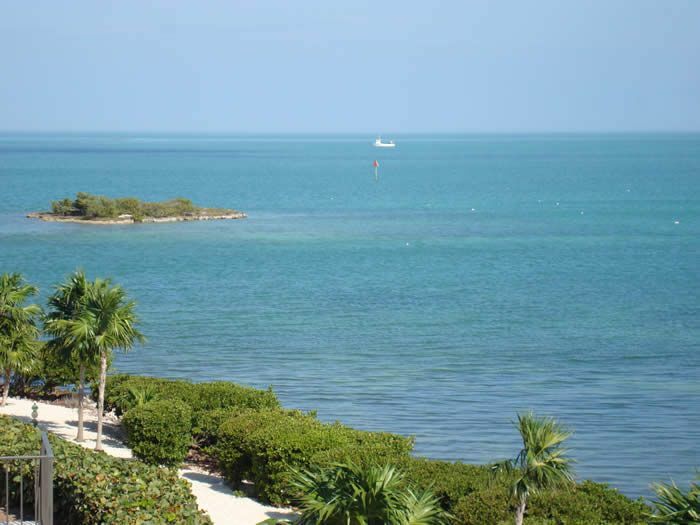 Seaglass-Paradise on the Gulf is located in the heart of the the beautiful Florida Keys. The Keys are a series of 40 islands connected by 40 bridges , off the southern most tip of Florida. The chain of islands extends 120 miles into the Atlantic Ocean and Gulf of Mexico. The area is famous for its Caribbean weather and world-class fishing and diving. This luxurious two-bedroom/2.5-bath townhome is located 20 feet from the beautiful Gulf of Mexico. There is access to wrap-around walk-out terraces from the living room and Master bedroom from which you'll have spectacular views of sea life, ocean birds, and a parade of pleasure/fishing boats going to and from the big water. The full view of the sunrise and the sky color at sunset -- and the sound of the waves as you close your eyes at night, will stay with you long after your vacation ends. This unit is beautifully appointed and immaculately maintained. Below the unit is a covered parking area for your car and boat trailer. And there's boat dockage just 100 feet from the front door. The swimming pool is 30 feet from your balcony. There's a king-size bed in the master bedroom, two queen-size beds in the second bedroom, and a sofa sleeper in the living room. A beautiful private beach is available to Seaglass guests within a 2 minute drive or a 15 minute walk. We live in Wisconsin, and like so many in our part of the world we sought out warmth and sunshine during the winter months. After many visits to many warm weather venues we discovered Paradise in the Florida Keys. Our first visit was in 1978 and we have come back every year since. We chose Seaglass in Gulfpointe 2 because it has everything we love about the Keys. It is secluded and quiet but still walking distance to our favorite beach and restaurants. Our home is spacious and the views are fantastic from just about every room. Seaglass is right on the water and from our balcony you will see ocean birds and aquatic life that will keep you entertained. Our location is convenient to great attractions to the West in Key West and to the East with all of the Islands in the Islamorada chain. As our guest you will have access to a private beach in Key Colony (Inch Beach) which can be reached on foot or via a 2 minute car drive. Magnificent views from living area, master bedroom and upper and lower wrap around balconies. Can be rented on Key Colony Beach 2 miles away. You can rent a boat on Key Colony Beach 2 miles away and dock it at the Gulfport 2 dock. Par 3 Golf Course on Key Colony Beach, which is 3 miles away. Sombrero, a full size 18 hole golf club is open to the public, and is 6-7 miles away behind the Publix Grocery Store. Property was as shown and described on VRBO. This is a beautiful condo, with a beautiful view and very clean. We were pleased with all the kitchen supplies and new grill. It is spacious so the 4 of us had plenty of room. It is also very secluded in a quiet area and with Key Colony across the street there is a great walking path, par 3 golf, Pickleball and some nice shopping nearby as well. Oh, another biggie - the beds and pillows were very comfortable!!! As I said, WE WILL BE BACK!!! Thanks so much for the kind words. It is difficult to convey the true beauty of that location thru photo's but you folks discovered some of the real high points of Seaglass. You will discover more on your next trip. If you folks enjoy fishing you might want to try your luck off the pier. It can be outstanding. Thanks for staying with us and please come back. It gets better as you learn more about the beautiful Florida Keys. Had a wonderful time at Seaglass! It has all the amenities you need. Washer/dryer, good size fridge, blender (Loved it), toaster, cups, etc. We spent every morning relaxing outside on the deck and staring at that beautiful view. We enjoyed the large pool just steps away which we had all to ourselves most of the time. We also spent a lot of time on the dock which is nearby too. From the dock, we caught several different varieties of fish of which the largest fish we caught was stolen by a shark before we could reel it in. We also saw from the dock a sea turtle, manatee and more sharks (I don't recommend swimming there:) Very quiet neighborhood and clean grounds. You can walk to Sparky's behind Holiday Inn and to The Island Fish Company. Both have great food. We also used Captain Hooks which is close enough to walk to also. Thanks for sharing your condo! The location is great,yes we caught fish off the dock.Nice pool comfortable beds well supplied has everything you need super clean.We will be back! after you contact Homeaway because I do offer some special incentives for returning guests. Marathon has everything that the Keys have to offer. Water everywhere, ocean museums, world class diving and fishing, incredible fresh seafood every day and it's easy to find your way around. One main street, that's it. Look for the many fascinating festivals in Key West or the art festivals that occur throughout the Keys and the wonderful beaches for total relaxation. All this, and the most laid back atmosphere in the world. You will want to come back again and again. There is a refundable Security deposit ($500.00) due at time of booking to hold the reservation. Total rental is due 30 days prior to the first day of your stay. Security deposit returned promptly if no excessive cleaning or damage.